1. 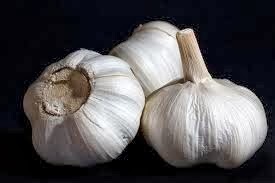 Raw garlic used to treat common problems like cane and pimples. Eating two to three pods of raw garlic every single day will help to keep the cholesterol levels in control in our body. It can also fight high blood pressure and lower it considerably. 2. Some of the other health benefits of garlic pods are that we can use them to cure small infections like pin worms and other kinds of worm. 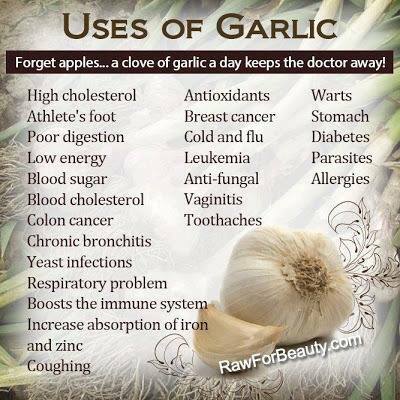 You can have a few garlic pods along with warm water in the morning and it acts as a deforming medication for you. 3. Garlic boosts your immune system. 4. Garlic is anti-aging, its antioxidant power neutralizing free radicals that procure aging and disease. 5. Garlic helps reduce plaque build up (atherosclerotic heart disease). 6. Garlic thins the blood and helps to prevent blood clots (fibrinolyisis) hence reducing the risk of strokes. 7. Garlic helps to prevent cancer, particularly of the digestive system, and reduces the size and arrests the growth of certain tumors. 8. Garlic lowers and regulates blood sugar levels. 9. Garlic helps to remove heavy metals such as lead and mercury from the body - natural body detoxification. 10. Garlic (raw, containing allicin) is a natural antibiotic and can kill even drug resistant strains of bacteria such as MRSA as well as Helicobacter pylori, the bacterium known to cause stomach ulcers and implicated in stomach cancer. 11. Garlic is anti-fungal and reduces yeast infections in body parts. 12. Garlic can also reduce the risk of developing atherosclerosis (hardening of the arteries). 13. Compounds in this familiar bulb kill many organisms, including bacteria and viruses that cause earaches, flu and colds. Research indicates that garlic is also effective against digestive ailments and diarrhea. 14. Pharmacologists at the University of California found that allicin -- the active ingredient in garlic that contributes to bad breath -- is an infection-killer. 15. In 2007, dentists in Brazil found that gargling with garlic water (made by steeping crushed garlic cloves in warm, but not boiling, water) can kill the germs that cause tooth decay and gum disease. 16. Garlic has been known for its health benefits since ancient times. 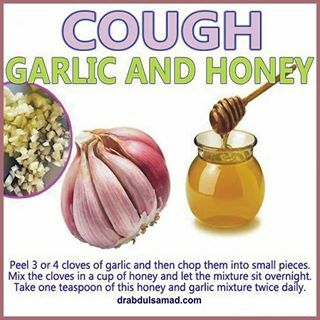 It can treat so many infections in the body right from the common cold to cough and bronchitis.